How can I offer $140 shirt for only $39.50? I received an Ad insert for Charles Tyrwhitt shirts with Saturday’s WSJ. Yes, as a matter of fact I still get the real paper newspaper, but we digress. 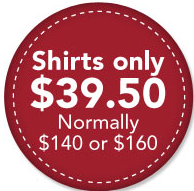 The Ad offered all kinds of dress shirts for a single price of $39.50 (normally $140 to $160). The Ad, speaking in the voice of the shirt company founder, then poses the question you see in the post title and answers it for us. You can see at play some of the behavioral pricing tactics – price anchoring with stated high price and signaling great value with marked down prices. Besides the tactics the explanation does not answer the original question. In fact that is not the right question at all. How is it a shirt that likely costs less than $39.50 to make is normally priced at $140-$160? Unfortunately it is not the case with apparel pricing. Pricing is not as sophisticated as you believe it is. It is steadfastly stuck in the land of cost based pricing with standard markups. The data for this comes from an article in WSJ that analyzes pricing of $155 polo shirts. Almost the same, down to the sub-category level and price point. The article does a marvelous job of marginal cost analysis. Most articles on cost analysis commit cost allocation error – allocating a share of all fixed costs to every unit made. This analysis gives us a true marginal cost of $29.57 for a polo shirt. We won’t be far off to assume that Tyrwhitt shirts have the same cost structure. Here are your answers for both the original wrong question and the right question. How can a producer offer a $140 shirt for only $39.50? Because it likely costs them less than $39.50 to make one so they can still make profit per unit and the $140 price is based on wholesale and retail markups. Because of the antiquated way of setting wholesale and retail prices of apparels. Interesting post. I frequently think about price when buying a shirt.